The Star card indicates a renewed sense of hope and faith in the Universe, usually after a difficult period. As the Star card sequentially follows the Tower in traditional tarot, there are elements of “picking up the pieces” present in this card. You may be feeling more inspired after a period of disappointment or disillusionment. You may be more aware of your connection to other people and to the world around you. And you may be more conscious of how all of your actions reverberate into cause and effect principles that boomerang right back to you. The Star is all about Universal harmony and synchronicity. It’s about being one with the Universe and feeling connected to every single other living thing. 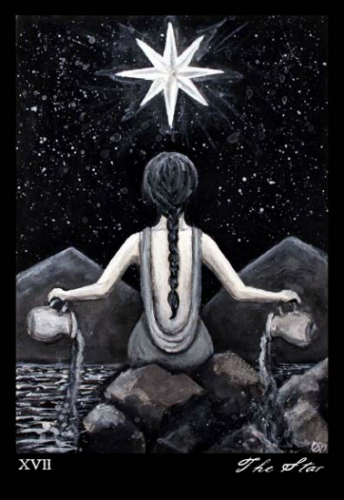 We see it in the almost perfect symmetry that’s present in this version of the card: from the 8-pointed star in the sky, to the mountains on either side of it, to the vessels in the woman’s hands from which she pours water into the sea. There are as many possibilities before you as there are stars in the night sky. If you play your cards right you could be wishing on one tonight and thanking your lucky ones tomorrow! This card is part of the Phantonwise Tarot series, designed by Erin Morgenstern, author of the NY TImes bestseller The Night Circus. This deck was painted entirely in black and white acrylic and is now sold out. Erin does sell limited edition prints through her Etsy storefront. 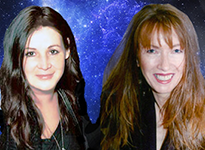 Next Post: Ask the Astrologers: Should I Stay or Should I Go?